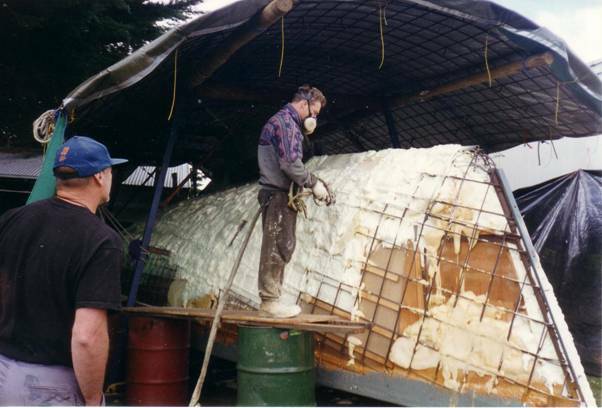 Peter Bourne developed an innovative method for building boats that uses sprayed polyurethane foam as an integral part of the construction. 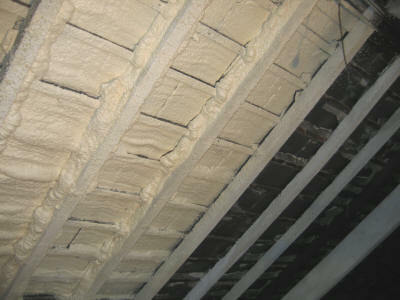 Spray foam significantly shortened and simplified the construction and saved a fortune. This article examines the Bourne method of boat building and provides links for more information. Insulating warehouses lowers energy bills and prevents condensation dripping. Converting an old fishing trawler to a live-aboard boat throws many challenges at the unsuspecting boat enthusiast. Not least of all insulation. Read how Handi-foam is simplifying the task of insulating the accomodation spaces of a large ex-fishing trawler. Hurlingham Yacht Club repaired a leaky pontoons by filling it with expaning foam. This article describes the different insulation materials available to the DIY market for the insulation of boats. 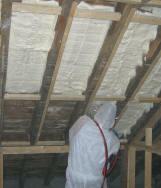 We go into detail discussing rock wool, celotex, Thinsulate, polystyrene and polyurethane boards as well as Sprayed Foam Insulation. Handi-Foam has a great many applications, one of them being Foam-in-place and sometimes known as Foam-in-a-bag packaging. On this page we include detailed photos of the expanding foam packaging procedure, as well as a written guide to help you decide whether sprayed foam is the best route for your packaging needs. 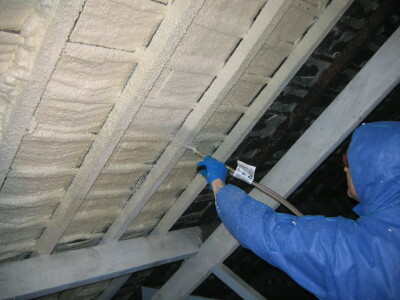 2-component Spray Foam is an excellent solution for insulating grain stores, animal shelters and even barn conversions. Click on the link above to find out more. A wonderful way of saving on the heating costs for your Hot-tub, is to ensure that you are not losing excessive amounts of heat. Click on the link to find out how expanding foam insulation helps you to insulate the underside of your Jacuzzi and lower your heating bills! Sealing the joints between panels can be time consuming and not very effective if you are using the wrong foam. To find out more about 2 component expanding spray foam and it’s uses in insulating cold stores, click on the link above. Polyurethane foam is used in many industrial applications for everything from insulating pipes and valves, to this unusual application, in which a compressor station floor was insulated to protect against the extreme cold in Kazakstan. Up to 25% of heat loss occurs through the exterior walls of your house if the cavity is not properly insulated. This is a significant figure when applied to your heating bill. Our cavity wall page gives a step by step guide on how to effectively insulate your cavity wall with Sprayed Foam Insulation, thereby reducing your heating bill. The other advantage to properly insulating your home with expanding foam, is that you are playing a responsible role in reducing the energy demands on the environment. Handi-Foam has many uses in the film, stage and art industry. The sprayed foam is a versatile medium to work with and can be used to construct sculptures, foam scenery and even foam moulds. The art foam can be easily sculpted and sanded smooth and painted, and unlike polystyrene, if you make a mistake, you can simply re-spray over the error and correct the mistake. Too hot in summer and too cold in winter? If you are experiencing these problems, you should consider insulating your summerhouse as it will help to regulate the temperature within, making you far more comfortable. Click on the link to find out more about Summerhouse Insulation. When a builder cut corners and left the top part of a wall uninsulated, a homeowner was left with a cold house. Find out how Handi-foam provided a low cost solution. It is often difficult to compare different insulation materials as you need to visit a dozen different sites to do so, some of which, are more than a little reticent to let you have the information regarding insulation values and cost. Our page gives you a direct comparison of cost of insulation, insulation values and value for money. This guide explains how to measure up and decide how much foam you will need. Read our General Spraying Guidance for a simple and concise set of instructions on how to use expanding foam. On this page we use photos to demonstrate how one connects the gun & hose assembly to the A Component & B Component cylinders. Soundproofing can be a bit of a mine-field in terms of finding the most effective solution to your noise problems. This article discusses the various types of sound in order to help you find the best solution. This guide discusses the most common problems encountered when using your expanding foam kit and how to avoid causing those problems. If you have a corrugated roof, please make certain you read this article. Corrugations do tend to add to the overall surface area, so make certain you have an idea of how much extra your corrugations will increase the amount of expanding foam you will need. In this article we demonstrate the construction of a naturalistic foam hide for the vivarium of a bearded dragon. This principle can also be applied to hides for a variety of reptiles, right from a boa constrictor to a blue-tongued skink.